For companies of all sizes, figuring out how to do more with less permeates every aspect of business operations today, especially the delivery of IT services. In today’s fast-moving digital environment, many are challenged to transform their IT organizations and provide an automated, self-service approach to IT services delivery, especially with limited resources and expertise. “The Cloud” is seen as a means to achieve IT transformation by providing the automation and self-service capabilities that enable IT organizations to become more efficient and drive agility and responsiveness. A hybrid cloud provides IT with the control, reliability, and confidence of private cloud with the simplicity, flexibility and cost efficiency of a public cloud – but how do you get there? Hybrid cloud solutions from Dell EMC and VMware provide self-service provisioning of automated cloud services to end users and infrastructure administrators in a familiar, user-friendly VMware environment. 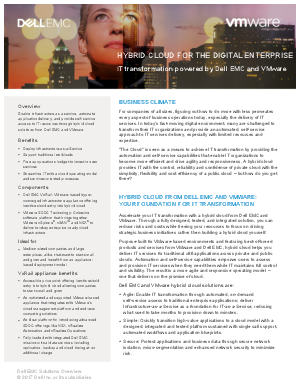 This solution brief explores the advantages of hybrid cloud solutions built on Dell EMC hyper-converged infrastructure and VMware software-defined data center software.